This new arrived fruit game will make your gains go up in flames! 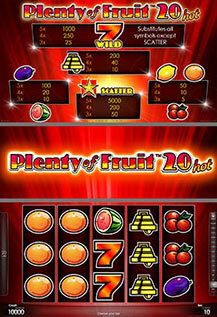 Plenty of Fruit™ 20 Hot gaming fun is guaranteed on these 5-reel, 20 lines fruit game. Watch out for the Wild 7 – it will make your day and provoke you a very special emotion of happiness. The Wild 7 substitutes for all symbols except for scattered STAR. All wins are for combinations of a kind and are paid for combinations from left to right on fixed lines, except Scatter. Scatter symbols pay in any position and the wins are added to line wins.